Storm was adopted in 1997 by Tom, who writes, " I should have done this a long time ago, but better late then never. I got Storm in Fall 1997. I was told that at the time he had been at Kitty Angels the longest which was a good enough reason for me to adopt him. "He got out about four years ago and we were able to trap him after eight days! He was a scared kitty then! He recently got out again, but with lots of support from Kitty Angels, we trapped him again. "Both times I left the back door open for just 20 minutes and he snuck out. I feel very lucky to have him back." 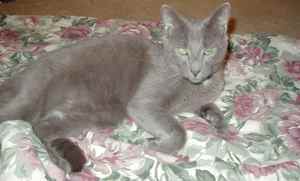 Laura writes, "I adopted 'Blue' (formerly 'Slate')from Kitty Angels in May 2003. 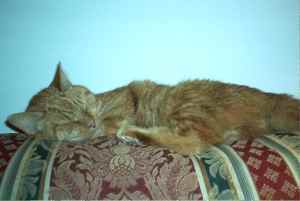 At that time I was still grieving from the death of my longtime cat and I thought the best way to heal would be to adopt a new cat. As soon as I was introduced to Blue by Joan, I knew he was the one - he was very affectionate right from the start (although the first few days in my home he was a little 'skittish'). 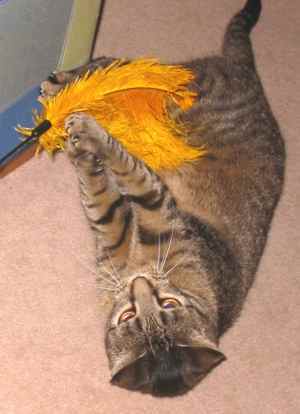 "He has really blossomed into such a wonderful cat. He's very cuddly and extremely playful, and one unusual trait I had never seen in a cat before is that he loves to play fetch with his toy mice. He always retrieves his mice when I throw them and he will carry it back to me in his mouth and drop it at my feet like a dog might do. Blue is a very happy boy and while he may think he's the lucky one getting such a nice home and a loving owner, I am truly the lucky one to have found him." Tara writes, "Thank you for adopting to me, my little Tituba, (a.k.a., 'Nella'). I was at the PetSmart just this past Sunday in Nashua, and already have pictures of the little girl! She is getting along great with my other cat, Morris, who adores her! She has a great appetite, and is already sleeping with me in the bed and taking over the place. I love her!" Mandy and Tony write, " We adopted Melody in June of 2003 and she is absolutely gorgeous! She is the most wonderful cat either of us has ever owned in our entire lives! She loves to look out the windows and watch the leaves blowing around, she loves chasing her feather toy and that she's a big fan of snuggling on laps. "We attribute her fun and easy going demeanor mostly to the care she received while in your hands. It is our pleasure to give Melody a home. Our lives are so much richer with her around. Again thanks!" 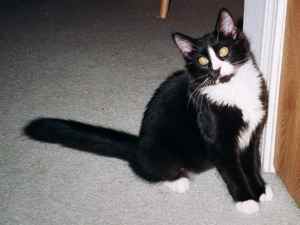 Pam and Gary write, "Chilly (black and white), adopted in June 2003, has blossomed so much, the difference is incredible, she is one hundred percent lap cat now! Still a little skittish if you reach for her, but she has no problem creeping right up onto my neck to snuggle in the morning. 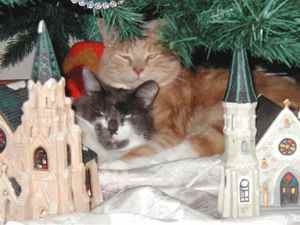 Thanks to Frasier(orange) she has adjusted wonderfully!"